Top photo: Students touch the roadrunner statue for good luck. Middle photo: Statue artist R.G. Box stands next to his creation. Bottom photo: At the sign unveiling are (from left) Ms. UTSA Rebecca Smith, Rowdy, President Ricardo Romo and Mr. UTSA and SGA President Zack Dunn. 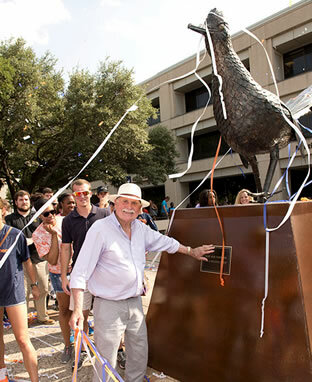 (Aug. 28, 2014) -- The UTSA Main Campus Central Plaza was covered with orange, white and blue confetti yesterday as students, faculty and staff turned out to celebrate the new permanent home of their six-foot-tall, 1,000-pound iron roadrunner statue. Prior to the dedication, the UTSA Spirit of San Antonio Marching Band, UTSA cheerleaders and Rowdy energized the crowd with performances at the historic event. UTSA President Ricardo Romo, Student Government Association (SGA) President/Mr. UTSA Zack Dunn and Ms. UTSA Rebecca Smith gave welcoming remarks. Romo thanked the SGA and Sigma Pi Fraternity for showing great student leadership in 2010 by coming together and exploring ways to boost school spirit on campus. 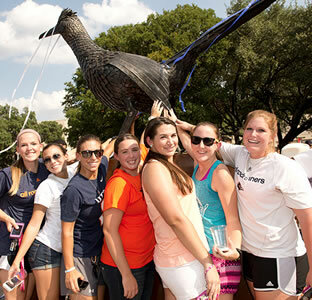 The students sought to commission UTSA's first-ever roadrunner statue and create a new university tradition. "I am proud to be your president," said Romo. "This roadrunner statue will represent you, your pride and your future." Lubbock artist R.G. Box, who had conversations about the statue with UTSA Associate Athletic Director Jim Goodman, spent 1,000 hours to complete the artwork. A fundraising campaign, Bring Rowdy Home, inspired by students and coordinated by the UTSA Office of Annual Giving, raised more than $25,000 in one week. Contributions to support the campaign came from UTSA students, faculty, staff, alumni and benefactors from across the country. Box thanked the students for the nice comments about his creation and autographed posters of the roadrunner statue that has become the new symbol of pride for UTSA. Following the statue dedication, UTSA students, faculty and staff gathered for the President's BBQ, an annual tradition on the Convocation Center east lawn. 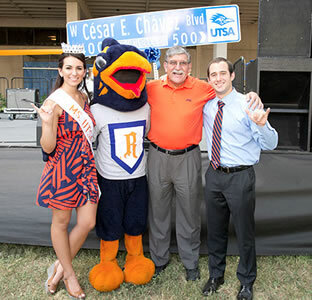 At the barbecue, UTSA and the City of San Antonio dedicated UTSA-themed street signs. The dedication and ribbon-cutting ceremony included Romo, Dunn, Smith, Councilman Ron Nirenberg, Councilwoman Shirley Gonzales and other city leaders. Ninety-four UTSA-branded street signs that include the Rowdyhead are currently under installation on public UTSA Main Campus and Downtown Campus streets and perimeters and at UTSA's Park West Athletics Complex at Loop 1604 and Hausman Road. Once installed, they will help residents and visitors recognize that they are in the vicinity of a UTSA campus, marking the UTSA Gateway District. Yesterday's dedications were two in a series of events during UTSA Roadrunner Days. The events, which run through Aug. 29, give UTSA students the opportunity to participate in time-honored traditions and connect with the campus community. For more information and the event schedule, visit the UTSA Roadrunner Days website. Share your Roadrunner Days experiences using hashtag #UTSARRDAYS.